The galaxy NGC3393 includes two active black holes (shown in inset) that are thought to result from the galaxy's merger with a smaller companion. In the new study, scientists may have unexpectedly detected a minor merger about 160 million light-years away in a galaxy dubbed NGC3393. Using NASA's Chandra X-ray Observatory, investigators have detected two black holes at its center, one about 30 million times the mass of the sun, and one at least 1 million times the mass of the sun, separated by only about 490 light-years. 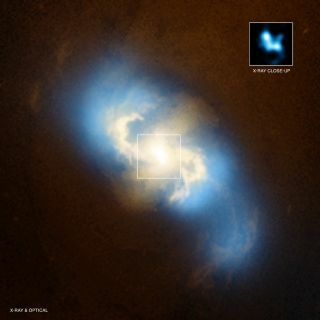 They are the closest supermassive black holes to Earth ever seen, according to a NASA statement. "Seeing this was altogether a surprise," study lead author Giuseppina Fabbiano, an astrophysicist at the Harvard-Smithsonian Center for Astrophysics in Cambridge, Mass., told SPACE.com. As galaxies collide, the results can be dramatic — for instance, nearby galaxies NGC6240 and Mrk 463, apparently the results of major mergers, show disrupted shapes and many new stars that have formed around their cores. In contrast, this newfound galactic product of a minor merger surprisingly has a regular spiral shape like the Milky Way and has a mostly old population of stars around its heart. "It doesn't look perturbed or anything," Fabbiano said. These findings support models that suggest minor mergers may not perturb the larger of the merging galaxies much. This could explain why these relatively commonplace mergers have not been spotted until now — there is not much evidence of the crash in visible wavelengths of light, and even when it comes to X-rays, one can only spot two black holes in a galaxy's core if both happen to be eating stars at the same time and thus unleashing radiation simultaneously. "Chandra is the only instrument that could have detected this, and even then, it was pushing the envelope of its resolution due to how close these black holes are," Fabbiano said. "Now that we know what is going on, we can go back and look at boring galaxies to see if we find anything." The scientists detailed their findings in today's (Aug. 31) online issue of the journal Nature.